Here we have a painting of Mr. Ed as he surveys his extensive land holdings. The singular accomplishments of Mr. Ed were the inspiration for Shakespeare's famous line: "My kingdom for a horse, of course of course, unless that horse is the Famous Mister Ed." In what was the equine equivalent of The Jazz Singer, Mr. Ed appeared in the very first film involving a talking horse. Soon after that he starred in a critically acclaimed TV show called "The Incredible Mr. Ed". His career stumbled however, when he developed an unusual case of Tourette Syndrome (previously undiagnosed in horses) and started to curse uncontrollably, blurting obscenities at his fellow actors. After his show was cancelled he went on to play a variety of non-speaking parts. 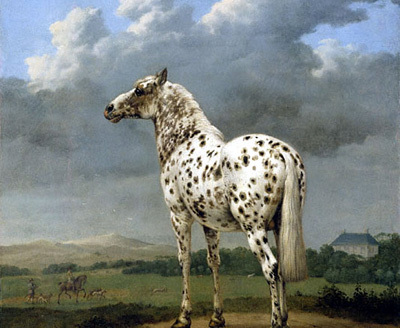 This particular portrait shows Mr. Ed after his cosmetic surgery to add the large spots prior to his desperate audition for 101 Dalmatians. A subsequent series of increasingly lame performances permanently hobbled his career. Tragically, after having been wished good luck with the old show biz saying "break a leg", Mr. Ed actually DID break his leg - and had to be put down.